Board meetings are held at the theater (unless otherwise noted on our calendar) the second Tuesday of every month at 7:30pm, all year round. Board member elections are held in June of each year. General member meetings are held at the theater (unless otherwise noted on our calendar) the third Wednesday of the following months: September, December, March, and June at 7:30pm. They are open to the public. The Village Players are a registered 501(c)(3) non–profit organization. Our members are made up of volunteers from the surrounding communities. We are a diverse group with varied ages, occupations and skills. All actors, members and staff are volunteers. We have been producing plays for over 7 decades. We produce 4 regular season productions, with 8 performances each production (6 evening and 2 matinee performances). Our season runs October through June. In addition, we offer benefits to groups and organizations. For more benefit information, click here. We also usually have some form of a summer production (one-acts, children’s theater, dramatic readings, musical showcases) that runs one or two weekends. Our plays are usually a comedy, drama, mystery, or a farce. During our intermission we have beverages and snacks for sale. We also hold a 50/50 raffle during intermission. Doors to the theater open 30 minutes before show time to purchase tickets. Season ticket holders do not have to wait in the ticket line and may enter when the doors open. Our venue is a renovated dairy barn that dates back to 1918. It was one of two cow barns on the Tanner family farm property. We currently have 152 plush, fabric seats, which were last upgraded in the Summer of 2015 – with an additional 10 spots in the front row for patrons with wheelchairs and their companions. In addition to being fully wheelchair accessible, our theater also provides many other modern amenities such as heating & air-conditioning, credit card acceptance, and a fully-stocked snack bar. The Village Players of Hatboro were born out of the success of a play that was put on as a fundraiser for the Junior Neighbors, a local women’s club. Shortly after, a member of the women’s club, Helen Cornell, suggested that they start a theater group and in April of 1947, The Village Players were created. With the backing of the local American Legion, their official debut was in May 1947 with the production, “The Late Christopher Bean”. 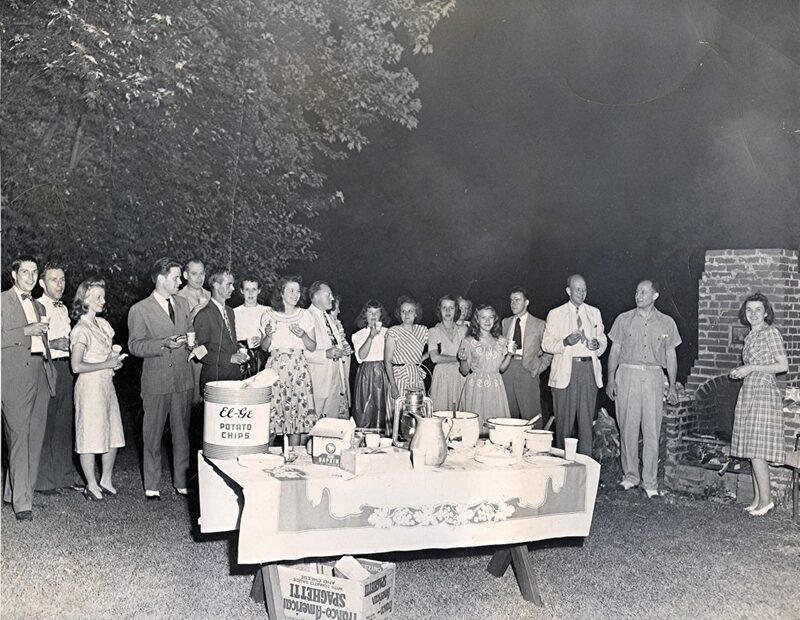 The theater group consisted of women from the club, their husbands, and their family and friends. Originally, the productions were held in the Hatboro High School auditorium, while the rehearsals were held wherever space allowed; often the Fulmor Heights Administration building. Edward Ott directed many of the plays during the first few seasons. Props and costumes were borrowed from each member’s house. In August of 1950, the Hatboro High School merged with the Horsham High School. Crowded conditions resulted and the Village Players were denied use of the high school auditorium. The news was unexpected, but as the saying goes, the show must go on. Director of the next show, Helen Cornell, along with Alice Gibson, suggested the use of the large two-story town hall building that the Ivyland Fire Company owned. A conversation with the head of the fire company, Mr. George Hobensack, Sr. was had, and a short while later the players were given use of the building. A total of eight years were spent in Ivyland. 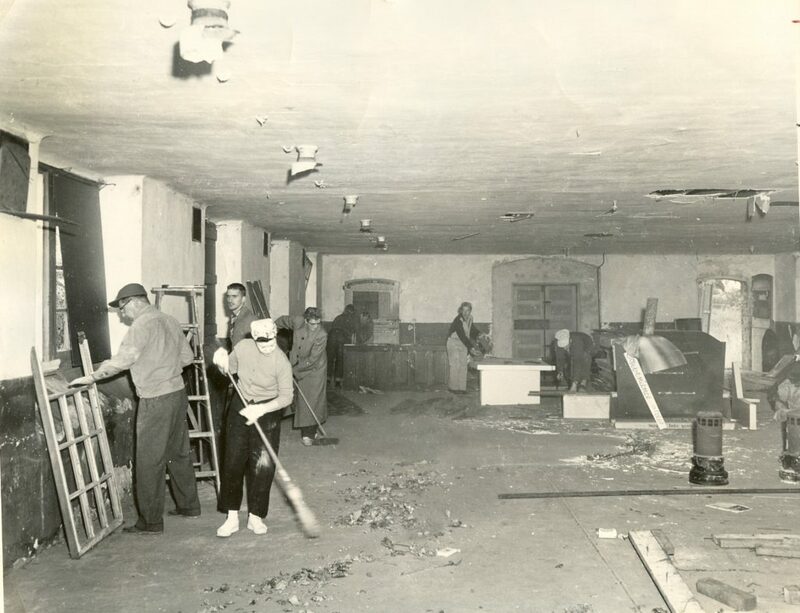 In 1957, our barn was then owned by The Union Club of Philadelphia. However, the barn itself dates back to 1918, when Christian and Sarah Tanner owned the dairy on that piece of land. Often mistaken for an old schoolhouse, the playhouse was one of the two cow barns that were on the property. During our productions we have a crew that helps with every aspect of the show. These volunteers are of great help and are extremely appreciated. They put in their own time and do not receive anything in return except the satisfaction of a job well done. They may be actors from other shows, friends, or family. We also have high school teenagers who volunteer for community service. The Village Players remains a fixture in the local community. In addition to bringing theatre to the community, we work together with other community groups in the surrounding Hatboro area. Most recently, we have collaborated with the Kiwanis Club in revitalizing Tanner Park. Some of the groups we have also worked with Elm Street District-Hatboro, Boy Scouts, Girl Scouts and First Fridays in Hatboro. On dress rehearsal nights, we have groups come in from the area’s retirement villages to see the performance at no charge.